BETHLEHEM, Ind. — Thousands of people are expected to flock to Bethlehem this weekend for the annual Autumn on the River festival. This year, a new exhibit is raising some eyebrows days before the event even starts. A pair of 10 pound, 10-week-old tiger cubs are at the center of this discussion. The debate is whether the cubs should be allowed at the festival. Event committee members say absolutely, while one woman emphatically says no. Trish Roehm is a longtime resident of Bethlehem. She runs an animal rescue organization out of her home. For years, she has helped organize the Autumn on the River event, but this year, she’s sitting out. “I don’t think it’s a safe environment for children and, as for education, it’s sending the wrong message to the public that these are cute, cuddly animals. They aren’t. They are wild animals,” Roehm said. Roehm doesn’t want the tigers at the annual gathering. Tim Stark owns an animal refuge in Charlestown. He applied for booth space at the Autumn on the River festival. 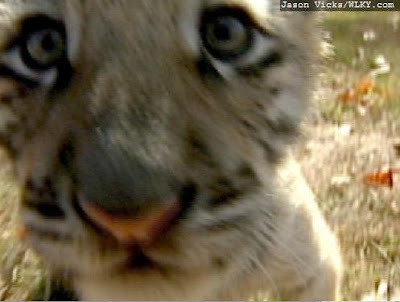 Stark’s plan is to give people the opportunity to take pictures with the Bengal tiger cubs. “I control the kittens. I control it. Its nails are clipped so they don’t scratch anybody. I am on the spot in case anything happens. They are just babies, 10-week-old babies,” Stark said. Stark’s house is home to the Wildlife in Need, Wildlife in Deed sanctuary. His nonprofit organization works solely on donations. “All these guys were raised here, they went through the photo shoot program, that’s how we fundraise. I have someone that is protesting that? I am in no way shape or form going to endanger anybody,” said Stark. Roehm said that despite her concern, the festival co-chairman told Stark it would be fine for him to set up his photo booth at the event. Stark said as an American, it is his right. “I carry a USDA license to do what I do, to raise, breed and exhibit them,” Stark said. David Abbott, the co-chairman of the event, said that as long as Stark produces his certificate of insurance and information about the cubs’ immunizations, then he is fine to set up his booth at the event. Stark said he has been doing this for years. Last weekend, more than 700 pictures were taken with the cubs at the Harvest Homecoming Festival in New Albany. Stark said that he has never had a problem with the tiger babies in public. The Autumn on the River Festival is Saturday and Sunday in Bethlehem.